Richmond won the NBL and AA league titles last year. Who will it be this year? The grass is cut, the foul lines have been marked out, the baseball gloves are well-oiled and the bats are ready to hit one out of the park. 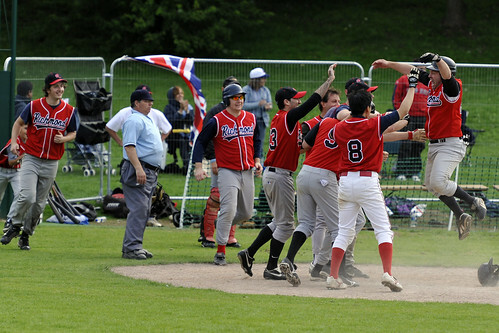 British Baseball prepares for the opening of the 2011 season. Clubs around the country have been preparing for this moment for the last six months. The time for talking is over. Let the battle for the league title begin. Just like all the other clubs around the country, the Herts teams are eager to get the show started. The club’s top team, the Herts Falcons will go into the new season with many new faces in their roster. They had a promising run of pre-season results against other National Baseball League (NBL) opponents so there is an extra spring in their step. Newly appointed manager, Lee Manning who has been a member of the club since it was founded in 1996, is excited about the team’s prospects. “Everyone is relaxed and excited about the season. The atmosphere has been great, and we’re really looking forward to it”, said Manning. The Falcons start their 2011 NBL campaign at home against the Southampton Mustangs, a team which made it to last year’s postseason playoffs in their first season in the country’s top league. The two teams met on Opening Day last year. The Falcons swept the Mustangs on that occasion but despite this Southampton ended up much higher in the league standings by the end of the regular season, so, whatever happens in these Opening Day series, it will not determine where these two teams will end up in August, but there is no doubt that both of them would want to get off to a winning start. The Herts Hawks open the season away at the Thames Valley Bisons. The Hawks roster looks much stronger than last year so it is not a secret that the club is very optimistic that the Hawks may have an outside chance of getting into the postseason playoffs. Co-Managers Greg Bochan and Andy Cornish have been preparing and planning meticulously for this day so now it is time to deliver. The Herts Raptors ended last season with one win and twelve losses, but despite this it was a fun season with the team members embracing the underdog spirit. Herts has once again attracted a wave of new players who are new to baseball so Manager Ken Pike will have the difficult task of turning them into a team which is capable of surprising the league against the odds. The team had moments of brilliance during the Herts Spring League which included a spirited fightback against the Essex RedBacks only to lose 16-17 in the final inning, so the Raptors’ prospects may not be as bad as some may think.